Many local communities have laws that prevent some stores from handing out single-use plastic bags. Some of these laws require stores to charge for paper and reusable bags, and allow the stores to keep the money made from selling the bags. In 2014, the Legislature passed a law that banned single-use plastic bags at certain stores across the whole state. The law also requires stores to charge customers 10 cents for other types of carry-out bags made from paper or thicker plastic, and allows stores to keep the money. Because Prop 67 qualified for the ballot, the law the state passed in 2014 has never gone into effect. Prop 67 is a “referendum” that asks voters to decide if the state’s ban on single-use plastic bags should go into effect or not. Voting “yes” on Prop 67 would allow the 2014 state law to go into effect. Across California, single-use plastic bags would not be allowed at grocery stores, convenience stores, large pharmacies, and liquor stores. These stores would be required to charge for paper or thicker plastic carry-out bags and they would get to keep the money. Voting “no” on Prop 67 would prevent the law from going into effect across the state. Costs would be relatively small. State costs for overseeing the law would be less than a million dollars. These costs would be paid for by fees placed on companies that make plastic bags. Single-use plastic bags are bad for the environment and harmful to wildlife. Prop 67 protects animals and saves the state millions of dollars in clean-up costs. Many communities have already banned single-use plastic bags. It’s time to extend the ban across the state. Prop 67 would require stores to charge 10 cents for bags that can be reused, instead of offering them for free. Prop 67 would allow grocery stores to keep millions of dollars from selling these bags. Should the law passed by the Legislature banning single-use plastic bags be allowed to go into effect? In 2014, the California Legislature passed, and the governor signed, Senate Bill (SB 270), a law that prohibited certain retail stores statewide from providing single-use carryout bags to customers. The law, sometimes known as “the plastic bag ban,” also prohibited the stores from selling or distributing a recycled paper bag at the point of sale unless the stores charged at least 10 cents per bag. The law required stores to retain the money collected from bag sales and to use the money only for specified purposes, such as covering the cost of providing carryout bags. SB 270 would have gone into effect on July 1, 2015; however, its implementation was suspended in February 2015 when this referendum qualified for the state ballot. Proposition 67 is a referendum that asks voters to approve or reject SB 270. A YES vote on Proposition 67 means that SB 270 will go into effect. A NO vote means that SB 270 will not go into effect. Some 150 California cities and counties (about 40% of the state’s population), have their own single-use carryout bag laws. Those cities and counties are not covered by SB 270, and their laws will remain in place regardless of the vote on Proposition 67. Another proposition on this ballot, Proposition 65, could affect the implementation of Proposition 67. Proposition 65 would require that the 10-cent fee for carryout bags go to a new environmental fund, instead of being retained by stores. If both measures pass, the one with the most votes would prevail. Thus, if Proposition 67 receives the most votes, the 10-cent fee would be retained by the stores; if Proposition 65 receives the most votes, the 10-cent fee would go to the environmental fund, but the rest of Proposition 67 would still be implemented. Proposition 67 would have a relatively small fiscal effect on state and local governments, including a minor increase in state administrative costs and possible minor local government savings from reduced litter and waste management costs. Yes on Prop 67 is a common-sense solution to reduce plastic litter in our oceans, lakes and streams, and protect wildlife. Opposition to this law is funded by out-of-state plastic bag companies, who are trying to defeat this law in order to protect their profits. A ban on single-use bags would decrease manufacturing jobs and harm the economy. California consumers will be forced to spend 10 cents for every bag they are given at checkout, while grocers get to keep the resulting millions of dollars in consumers’ payments. Prohibits grocery and certain other retail stores from providing single-use plastic or paper carryout bags to customers at point of sale. Permits sale of recycled paper bags and reusable bags to customers, at a minimum price of 10 cents per bag. Relatively small fiscal effects on state and local governments. Minor increase of less than a million dollars annually for state administrative costs, offset by fees. Possible minor savings to local governments from reduced litter and waste management costs. Many Local Governments Restrict Single-Use Carryout Bags. Many cities and counties in California have adopted local laws in recent years restricting or banning single-use carryout bags. These local laws have been implemented due to concerns about how the use of such bags can impact the environment. For example, plastic bags contribute to litter and can end up in waterways. In addition, plastic bags can be difficult to recycle because they can get tangled in recycling machines. Most of these local laws ban single-use plastic carryout bags at grocery stores, convenience stores, pharmacies, and liquor stores. They also usually require the store to charge at least 10 cents for the sale of any carryout bag. Stores are allowed to keep the resulting revenue. As of June 2016, there were local carryout bag laws in about 150 cities and counties—covering about 40 percent of California’s population—mostly in areas within coastal counties. Passage of Statewide Carryout Bag Law. In 2014, the Legislature passed and the Governor signed a statewide carryout bag law, Senate Bill (SB) 270. As described in more detail below, the law prohibits certain stores from providing single-use plastic carryout bags. It also requires these stores to charge customers for any other carryout bag provided at checkout. Under the State Constitution, a new state law can be placed before voters as a referendum to determine whether the law can go into effect. This proposition is a referendum on SB 270. Below, we describe what a “yes” and “no” vote would mean for this measure, its major provisions, and how this measure could be affected by another proposition on this ballot. “Yes” Vote Upholds SB 270. Certain stores would be prohibited from providing single-use plastic carryout bags and generally required to charge at least 10 cents for other carryout bags. These requirements would apply only to cities and counties that did not already have their own single-use carryout bag laws as of the fall of 2014. “No” Vote Rejects SB 270. A store could continue to provide single-use plastic carryout bags and other bags free of charge unless it is covered by a local law that restricts the use of such bags. Prohibits Single-Use Plastic Carryout Bags. This measure prohibits most grocery stores, convenience stores, large pharmacies, and liquor stores in the state from providing single-use plastic carryout bags. This provision does not apply to plastic bags used for certain purposes—such as bags for unwrapped produce. Creates New Standards for Reusable Plastic Carryout Bags. This measure also creates new standards for the material content and durability of reusable plastic carryout bags. The California Department of Resources Recovery and Recycling (CalRecycle) would be responsible for ensuring that bag manufacturers meet these requirements. The measure also defines standards for other types of carryout bags. Requires Charge for Other Carryout Bags.This measure generally requires a store to charge at least 10 cents for any carryout bag that it provides to consumers at checkout. This charge would not apply to bags used for certain purposes—such as bags used for prescription medicines. In addition, certain low-income customers would not have to pay this charge. Under the measure, stores would retain the revenue from the sale of the bags. They could use the proceeds to cover the costs of providing carryout bags, complying with the measure, and educational efforts to encourage the use of reusable bags. This ballot includes another measure—Proposition 65—that could direct revenue from carryout bag sales to the state if approved by voters. 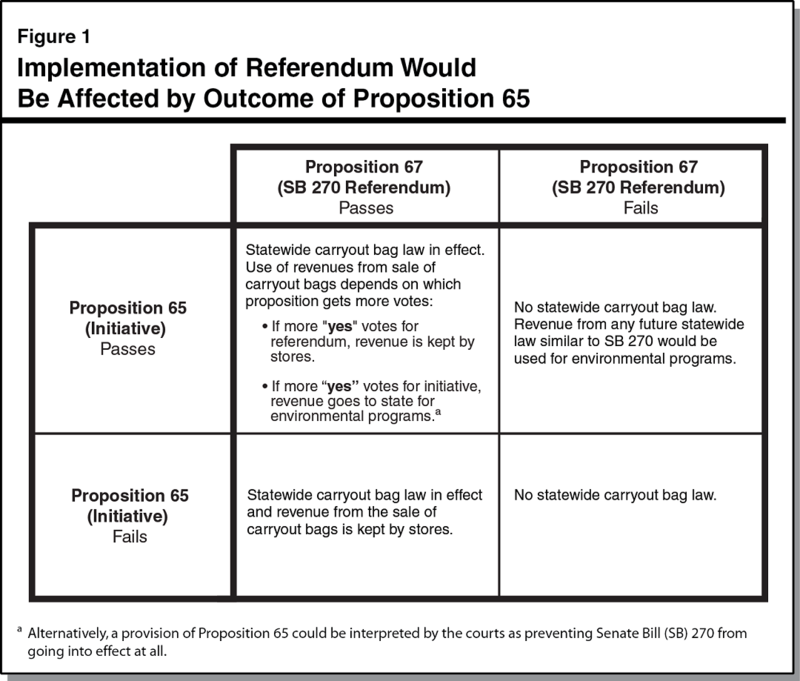 Specifically, Proposition 65 requires that revenue collected from a state law to ban certain bags and charge fees for other bags (like SB 270 does) would have to be sent to a new state fund to support various environmental programs. If both measures pass, the use of the revenues from carryout bag sales would depend on which measure receives more votes. Figure 1 shows how the major provisions of SB 270 would be implemented differently depending on different voter decisions on the two measures. Specifically, if Proposition 67 (this referendum on SB 270) gets more “yes” votes, the revenue would be kept by stores for specified purposes. However, if Proposition 65 (initiative) gets more “yes” votes, the revenue would be used for environmental programs. We note that Proposition 65 includes a provision that could be interpreted by the courts as preventing SB 270 from going into effect at all should both measures pass and Proposition 65 gets more “yes” votes. However, this analysis assumes that the other provisions of SB 270 not related to the use of revenues—such as the requirement to ban single-use plastic carryout bags and charge for other bags—would still be implemented. Minor State and Local Fiscal Effects. This measure would have relatively small fiscal effects on state and local governments. Specifically, the measure would result in a minor increase of less than a million dollars annually in state costs for CalRecycle to ensure that bag manufacturers meet the new reusable plastic bags requirements. These costs would be offset by fees charged to makers of these bags. The measure could also result in other fiscal effects—such as minor savings to local governments from reduced litter cleanup and waste management costs. Most grocery stores, convenience stores, large pharmacies, and liquor stores would be prohibited from providing single-use plastic carryout bags. Stores generally would be required to charge at least 10 cents for any other carryout bag provided to customers at checkout. Stores would keep the resulting revenue for specified purposes. Stores could continue to provide single-use plastic carryout bags and other bags free of charge unless a local law restricts the use of such bags. YES on 67 to REDUCE LITTER, PROTECT OUR OCEAN and WILDLIFE, and REDUCE CLEAN-UP COSTS. Single-use plastic shopping bags create some of the most visible litter that blows into our parks, trees and neighborhoods, and washes into our rivers, lakes and ocean. A YES vote will help keep discarded plastic bags out of our mountains, valleys, beaches and communities, and keep them beautiful. The law also will save our state and local communities tens of millions of dollars in litter clean-up costs. PLASTIC BAGS ARE A DEADLY THREAT TO WILDLIFE. YES on 67 CONTINUES CALIFORNIA’S SUCCESS IN PHASING OUT PLASTIC BAGS. A YES vote will keep in place a law passed by the Legislature and signed by the Governor that will stop the distribution of wasteful single-use plastic shopping bags. This law has strong support from organizations that are committed to protecting the ocean, wildlife, consumers, and small businesses. It will be fully implemented statewide once voters approve Prop. 67. Many local communities are already phasing out plastic bags. In fact, nearly 150 local cities and counties have banned single-use plastic bags. These laws have already been a success; some communities have seen a nearly 90 percent reduction in single-use bags, as well as strong support from consumers. OUT-OF-STATE PLASTIC BAG COMPANIES ARE OPPOSING CALIFORNIA’S PROGRESS. Opposition to this law is funded by four large outof-state plastic bag companies. They don’t want California to take leadership on plastic bag waste, and are trying to defeat this measure to protect their profits. Don’t believe their false claims. We should give California’s plastic bag law a chance to work, especially with so much success already at the local level. YES on 67 to PROTECT CALIFORNIA’S PLASTIC BAG LITTER REDUCTION LAW. DON’T BE FOOLED BY PROP. 67. It is a $300 million per year HIDDEN TAX INCREASE on California consumers who will be forced to pay a minimum 10 cents for every paper and thick plastic grocery bag they are given at the checkout. And not one penny goes to the environment. Instead, the Legislature gave all $300 million in new tax revenue to grocers as extra profit. Stop the sweetheart special interest deal . . . VOTE NO ON PROP. 67. STOP THE BAG TAX Prop. 67 bans the use of plastic retail bags and REQUIRES grocers to charge and keep a minimum 10 cent tax on every paper or thicker plastic reusable bag provided at checkout. Consumers will pay $300 million more every year just to use shopping bags grocery stores used to provide for free. Proposition 67 will grow profits for grocery stores by up to $300 million a year. Big grocery store chains get to keep all of the tax revenue. Grocers will grow $300 million richer on the backs of consumers. NOT ONE PENNY OF THE BAG TAX GOES TO HELP THE ENVIRONMENT The Legislature could have dedicated the new tax revenue to protect the environment, but it did not. Instead, it REQUIRED grocery stores to keep the new bag tax revenue. Prop. 67 is a deal cooked up by special interest lobbyists in Sacramento to grow profits for grocery stores. The Legislature passed SB 270 and hidden in the fine print is a NEW BAG TAX on consumers—a minimum 10 cents on every paper and thick plastic reusable bag provided to shoppers—all dedicated to grocer profits. STOP THE SWEETHEART DEAL AND HIDDEN BAG TAX VOTE NO ON PROP. 67. WE ALL WANT TO PROTECT THE ENVIRONMENT, BUT PROP. 67 IS A FRAUD. It is a $300 million per year HIDDEN BAG TAX on California consumers who will be forced to pay a minimum 10 cents for every paper and thick plastic grocery bag they are given at checkout. AND NOT ONE PENNY WILL GO TO THE ENVIRONMENT. Instead, the Legislature gave all $300 million in new bag tax revenue to grocers as extra profit. THAT’S $300 MILLION EVERY YEAR! STOP THE SPECIAL INTEREST SWEETHEART DEAL. In a sweetheart deal brokered by special interest lobbyists, Proposition 67 will grow profits for grocery stores by up to $300 million a year. Big grocery store chains get to keep ALL of the new tax revenue. Grocers will grow $300 million richer every year on the backs of consumers. DON’T BE FOOLED: NOT ONE PENNY OF THE BAG BAN TAX GOES TO THE ENVIRONMENT. The Legislature could have dedicated the new tax revenue to protect the environment, but their goal wasn’t to protect the environment . . . IT WAS ABOUT GROWING PROFITS FOR GROCERY STORES AND LABOR UNIONS. The measure SPECIFICALLY REQUIRES GROCERS TO KEEP ALL OF THE NEW TAX AS PROFIT! STOP THE SWEETHEART DEAL AND HIDDEN BAG TAX. VOTE NO ON PROP. 67. A YES vote on 67 confirms that California can move forward with its ban on plastic grocery bags. It’s that simple. Don’t be fooled by the deceptive campaign waged by plastic bag corporations from Texas and South Carolina, who claim they are looking out for our environment. Phasing out single-use plastic bags brings major benefits to California. These bags kill wildlife, pollute our oceans, ruin recycling machines, and cause litter that is expensive to clean up. Many local communities across California have already phased out plastic grocery bags, and a YES vote would continue this progress. Vote YES on 67 to protect California’s success in phasing out plastic bag litter and waste.